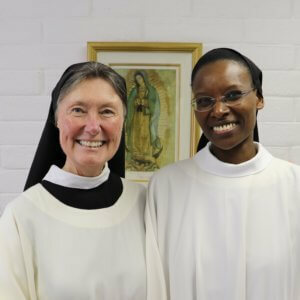 We are happy to introduce two new additions to our community of Santa Rita: Sister Hildgard and Postulant Sharon! Sr. Hildgard Wanjiku Mberere is a native of Kenya. She grew up not far from the Trappist monastery of Our Lady of Victoria and felt called to monastic life from a young age. Her call persisted over the years, and at last the monks in Kenya recommended her to the Abbaye N.-D. de Bonne-Esperance in Echourgnac, France. She entered our Order there in 2002. 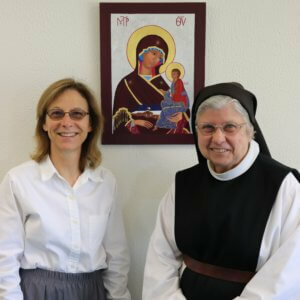 We are happy to welcome her to Santa Rita Abbey as she continues her monastic journey. Postulant Sharon Bezner entered our monastery on March 24, the eve of the Feast of the Annunciation. Sharon grew up in Texas and has worked a number of years in the physical therapy profession. She made a six-week observership with us earlier this year, and after returning home for a few weeks of discernment, asked to be received as a postulant. The postulancy is the first stage of monastic formation. During this time postulants study the Rule of St. Benedict and other aspects of our monastic way of life with the novice mistress. Postulants continue to wear ordinary clothes. If all goes well, at the end of a year, a postulant may ask to be received as a novice. Please keep both Sr. Hildgard and Postulant Sharon in your prayers. As we write this it is Wednesday of the 4th Week of Lent. Holy Week is coming up fast! It’s time for us sisters to pull out our Holy Week liturgy booklets and get ourselves organized. Singing practices begin soon! Our schedule for the special Masses and rites of Holy Week and Easter has been posted on our Prayer Times page (look under the Hospitality tab above). Be assured that your Arizona Sisters hold you, and all the world, in our prayers for a most grace-filled Holy Week and Easter.